Jennifer Lawson has not returned home Poppies Disco in central Glasgow. Her patriarchal father wants her found and turns to DI Jack Laidlaw. Laidlaw is a walking set of paradoxes, a former boxer but hater of violence, a believer in fidelity yet a serial philanderer, a pragmatic, instinctive man of action and a reflective philosopher, compassionate one minute antagonistic the next. He tells the father to go home and wait and that he’ll look into it. Later that morning a young woman’s body is found in a park having been raped and murdered. 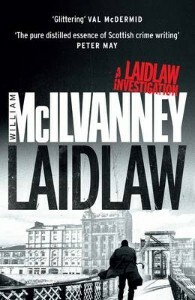 Laidlaw’s nemesis, DI Milligan is assigned to lead the main investigation. Laidlaw is given the task of skirting round the edges, looking for angles the main team might have missed. DC Brian Harkness, a fresh detective, is assigned to help him, warned to learn from Laidlaw but not get corrupted by his unconventional ways. Laidlaw sets off to find the killer using a mix of guile, wits and street knowledge and contacts, happy to ruffle feathers to see what emerges. He’s soon on the killer’s trail, but so too are others hoping to get to him before Laidlaw does. 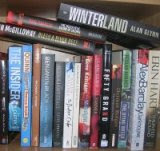 Laidlaw is the first book in what many consider a classic crime trilogy. First published in 1977, the book set out the blueprint for a generation of Scottish crime fiction detectives, both on print and TV: independent, contrary, hard, compassionate, world-weary, committed, reflexive and with a disastrous home-life; always a gamut of paradoxical traits. It’s easy to understand the book’s reputation. It’s a very engaging tale spun by a wordsmith and there’s very little to fault. The style is all tell and no show, with nice prose and excellent dialogue. The characterisation is keenly observed, with even very minor characters vividly drawn in just a few words. The plot has a strong hook and a nice blend of action, feints, twists and dashes of philosophical reflection. And McIlvanney spins a strong sense of place, time and social context. Overall, an excellent read that is as much about the human condition as it is a crime story. Wow, I am seeing reviews of this all over the place. This review definitely makes me want to read the book. I don't know how I missed this series. I love police procedurals.